Liverpool manager Jurgen Klopp admits Daniel Sturridge has to be handled with more care in future as the injury-plagued striker cannot cope with playing three times in a week. The England international is out for a number of weeks with a hamstring strain sustained in Sunday's 2-0 defeat at Newcastle - his third appearance in eight days. 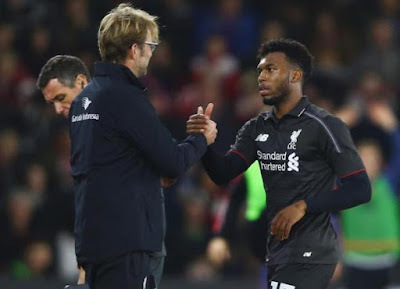 Klopp has said that with Sturridge's fitness record he should probably have given his forward a break, even though his longest spell was an hour in the Capital One victory at Southampton in which he scored twice sandwiched between 19 and 28-minute cameos off the bench. "Of course, in this moment, he cannot play three games in a week," Klopp said. "Nobody should do this too often. If you have a normal pre-season, if you have a normal period of time training, then you are ready for this. "It is a little hamstring [problem], nothing more, but we have to try together with him to make him more resistant. "It is no knee, no hip, no foot but this is a sign that it was too much for him. "Now we have 10 days, I would say, until we think about if he should play: that would be the Watford game maybe. "If he can run in eight days - eight days might be the longest time he has trained for in the last year - and be ready for physical training then maybe he is ready to play 20-25 minutes like it is. "That's how it is in a usual situation for other players like this. After Watford we then have a normal week (before Leicester at home on Boxing Day), then we have another six days where he could maybe train. If the world is perfect! "Then we will have 16 days where he has trained at a high intensity, so that would be a big step for us. We have to look for this now." Even Klopp marvelled at the quality of Sturridge's finishing in the game at St Mary's. But in his absence he will not put additional pressure on his remaining fit strikers Christian Benteke and Divock Origi - with the latter set to lead the line against Sion in their final Europa League tie in Switzerland - to step up another level. "I am not sure Christian and Divock can play that good to make everyone stop asking questions about Daniel - you asked me four questions about him and he's not even here!" said the German. "We have Roberto (Firmino) too who can also play the position and that's a good situation in that we have them. "If we didn't have, then of course we would have a big problem but we don't with these players. "I won't make pressure for them, there is no reason I will say: 'Okay, take your chance or leave' or something like this. We have to work together."